It’s that time of year!! The 19th Annual National Cornbread Festival is coming (April 25th & 26th)! Have you been yet? If you haven’t, I hope you’ll think about coming. It’s good old-fashioned family fun that descends upon the small little town of South Pittsburg, Tennessee. It’s also where Lodge Cast Iron is made. It is all things cornbread and cast iron at the festival. Plus there are games and rides, the Cornbread Cook-Off and food and crafts galore! The folks of South Pittsburg all jump in and volunteer to make this an amazing event. And this is the only time of year you can tour the Lodge Cast Iron foundry. I went last year and it was so awe-inspiring to see this American-made product come to life. I was so honored that the folks at Martha White have asked me to be a judge again at this years’ Cornbread Cook-Off. 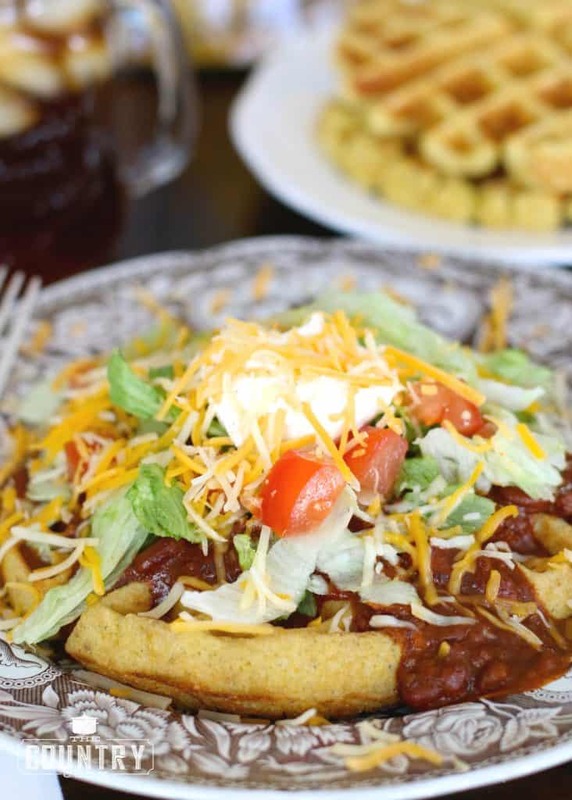 It is truly an honor to see home cooks creating the most mouth-watering cornbread dishes imaginable! And this year, there is a fun twist. Previous years’ winners are coming back to make their winning dishes once again to see whose dish reigns supreme over them all. But let’s be honest, they are all dadgum good so it’s going to be a tough job for the judges. I am looking forward to some good eats and cheering on all my fellow home cooks! Preheat your waffle iron to a medium-high setting. 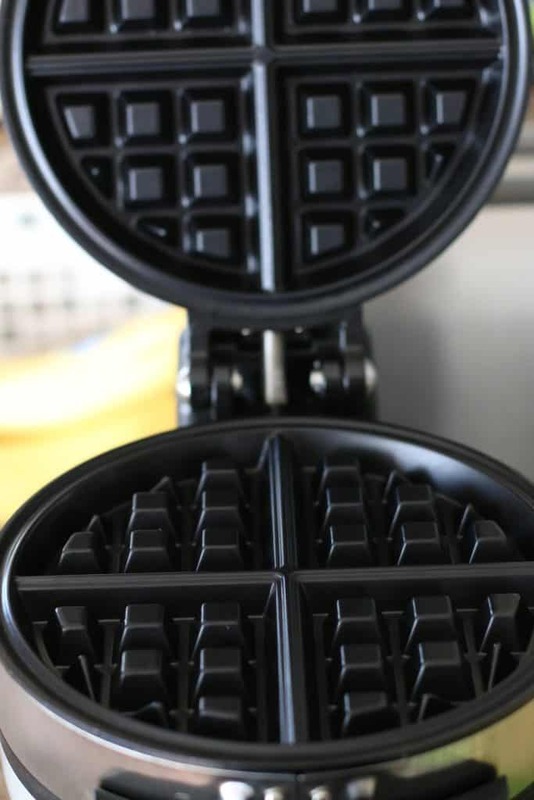 If your waffle iron has a number setting, set it to a number 4 (higher if you want a darker, crispier waffle.) My son likes his waffles lightly cooked so I make his first. I like mine a little more well done. Also at this point you will want to start heating up your chili. Pour both cans of chili into a covered pot and heat up until warmed through or pop it into a microwave-safe bowl and heat until warmed through. In a medium bowl, combine both packs of cornbread mix with eggs and milk. Stir well until combined. Once your waffle iron is heated, spray with nonstick spray. I like the kind with flour in it. 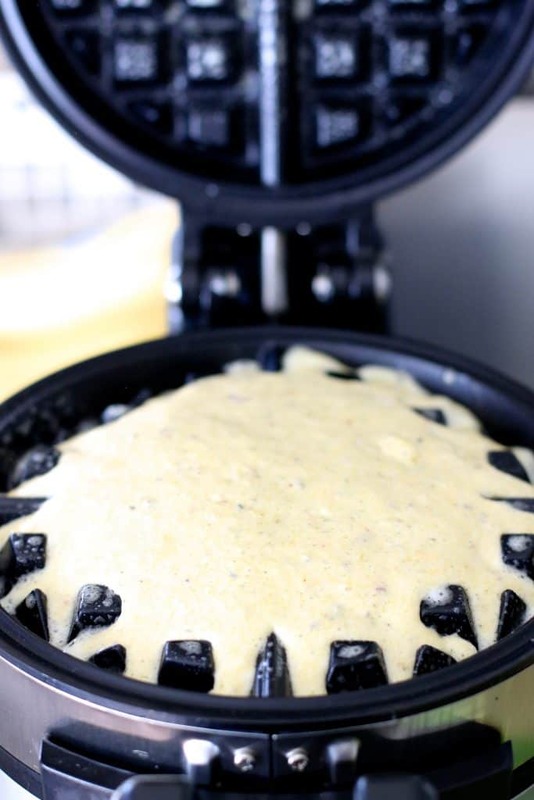 Pour one cup of cornbread mix onto waffle iron. Y’all, look at these waffles. They cook up perfectly in the waffle iron. 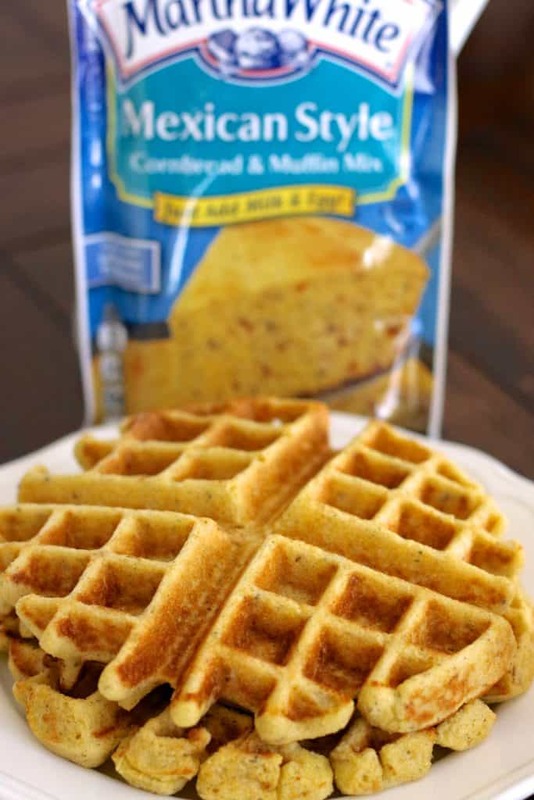 If you love your cornbread with crispy edges, then you will LOVE these waffles! Have everyone top their own waffles with what they like. Chili and lettuce, sour cream, shredded cheese and diced tomatoes. 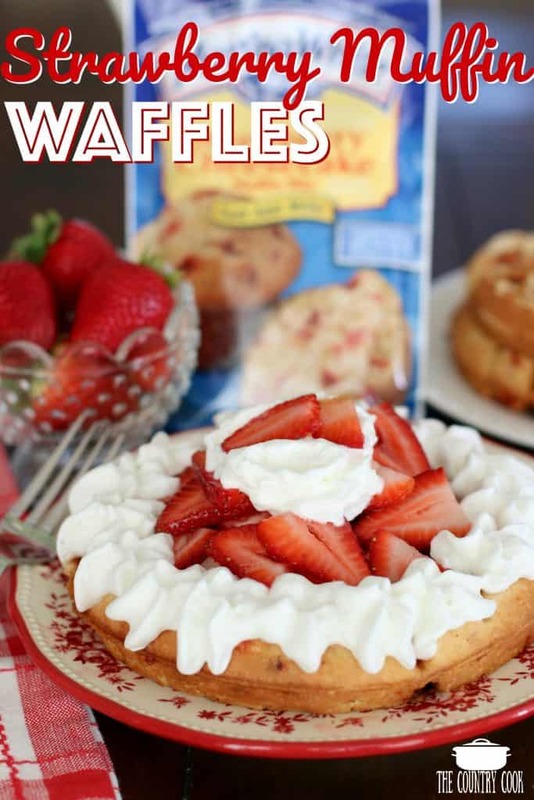 This recipe makes 4 large Belgian Waffles or 6 smaller waffles. Cook’s Notes: This would be a great idea for a “Cornbread Waffle Bar”. Just set out all the hot waffles along with all the fixins’ in a bowl and let your friends and family stack it up however they like! Also, there are plenty of ways to change this up! 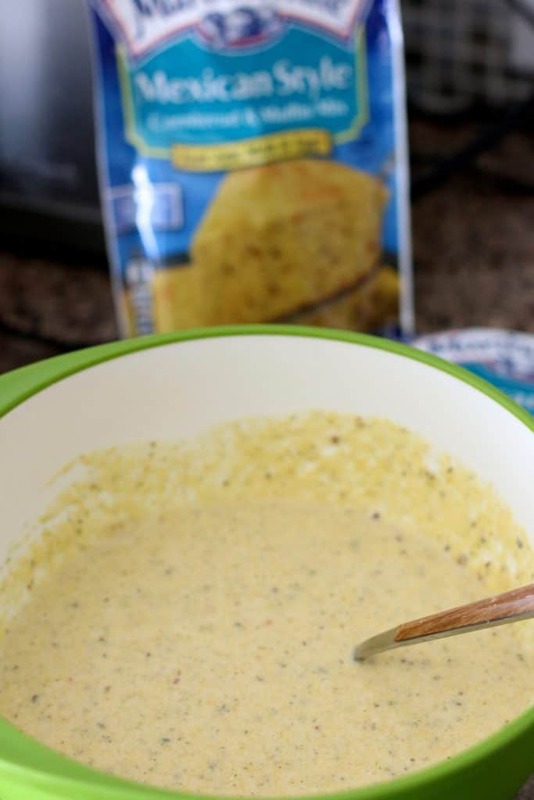 Use any of the Martha White Cornbread Mixes to change up the flavor. There’s Cotton Country Cornbread (this one is really good if you like a crispy cornbread – just skip the eggs part of this recipe), Sweet Yellow Cornbread, Yellow Cornbread, Buttermilk (skip the eggs for the Yellow and Buttermilk mixes), and now even Gluten-Free! Also, you could use a beef taco filling instead of chili! Or make it like a breakfast waffle. 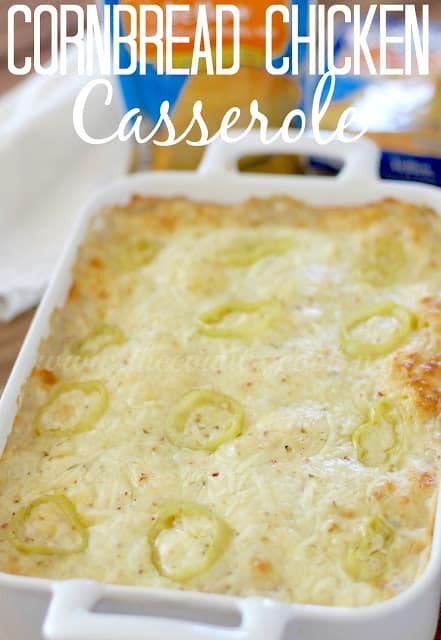 Use the Sweet Yellow Cornbread mix and add cooked bacon or cooked and crumbled sausage. And then serve with warm maple syrup! 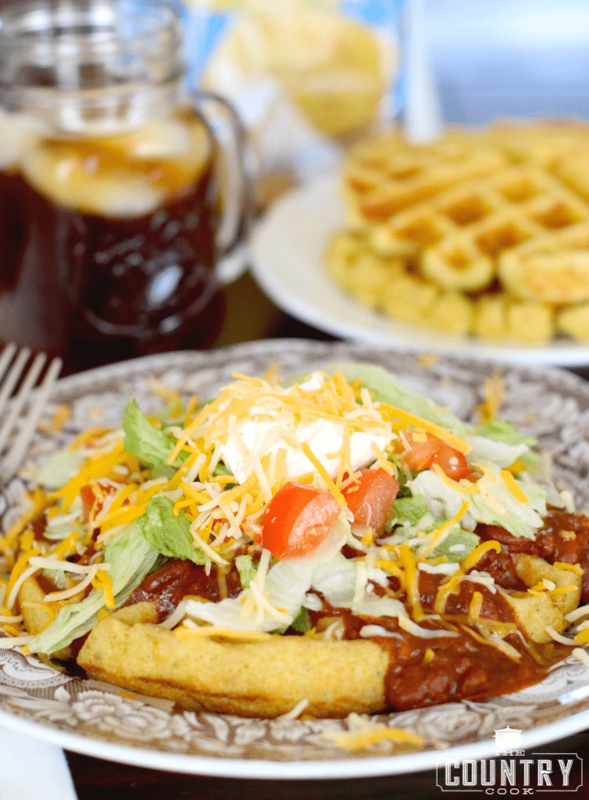 Cornbread waffles with chili and fixings is one of our favorite weeknight meals. Easy to make and the two flavors were meant to go together! Preheat your waffle iron to a medium-high setting. Also at this point you will want to start heating up your chili. 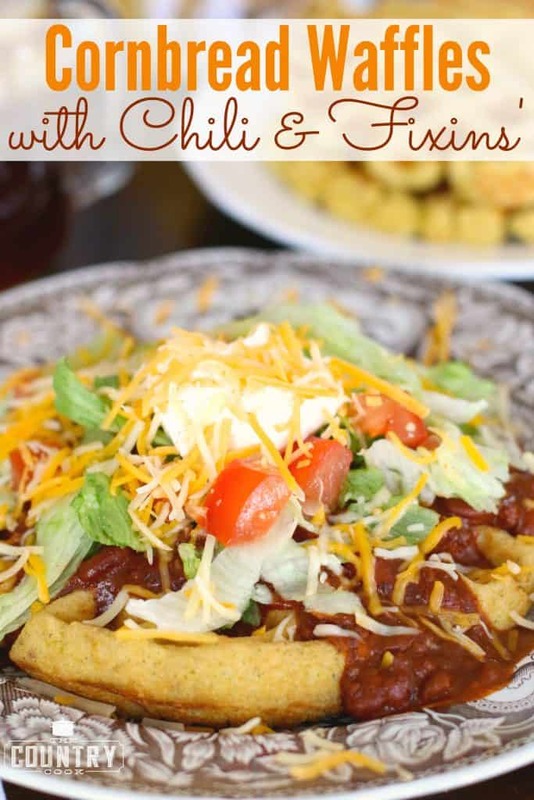 Pour both cans of chili into a covered pot and heat up until warmed through or pop it into a microwave-safe bowl and heat until warmed through. In a medium bowl, combine both packs of cornbread mix with eggs and milk. 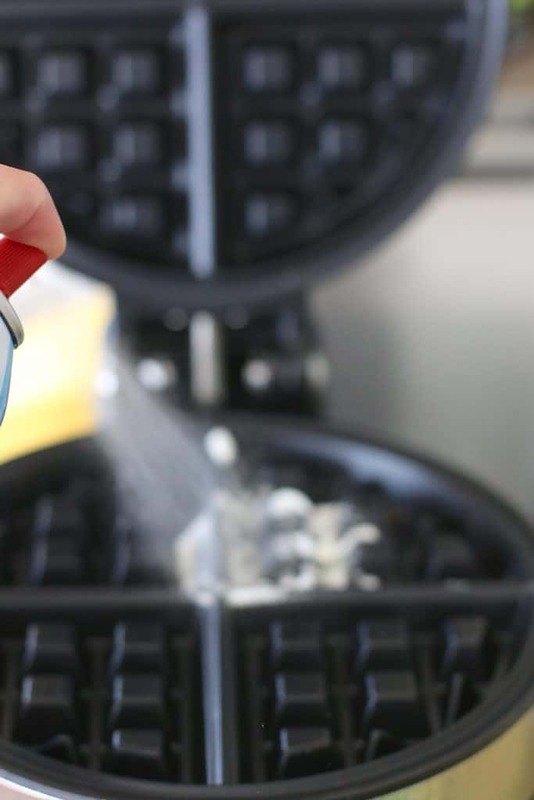 Once your waffle iron is heated, spray with nonstick spray. Depending on your type of waffle iron, the light will come on or it will beep when ready. Once they are all cooked up, it’s time for toppings! 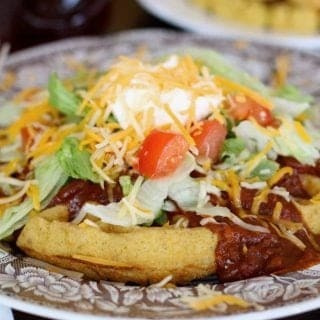 Top waffles with chili, shredded lettuce, diced tomatoes, sour cream and shredded cheese. Lots of ways to change this up! 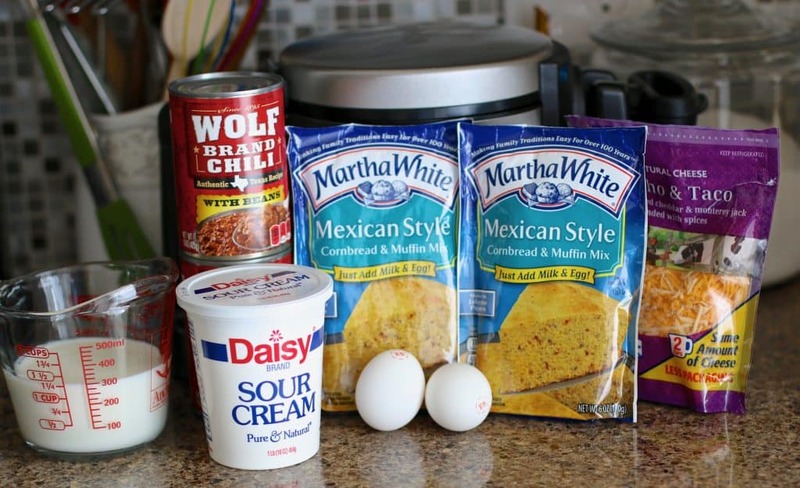 Use any of the Martha White Cornbread Mixes to change up the flavor. There's Cotton Pickin' Cornbread, Sweet Yellow Cornbread and Regular Yellow Cornbread. Also, you could use a beef taco filling instead of chili! Make it into a waffle bar! Or make it like a breakfast waffle. 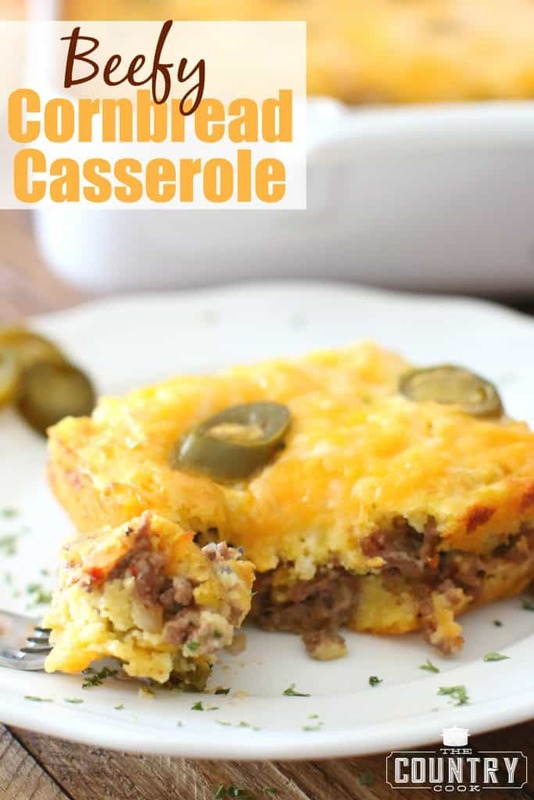 Use the Sweet Yellow Cornbread mix and add cooked bacon or cooked and crumbled sausage. And then serve with warm maple syrup! Sweet cornbread is my favorite! This recipe looks delish! I can't wait to try it. Any cornbread is wonderful to eat. Love the cast iron cornbread maker. Would love to win, as everyone else who signed up, lol. I am not fussy…I will eat any form of cornbread! Love it all! Idon't care I jusy love Cornbread. Unsweetened with butter and honey! We love all cornbread in this house. When I was a young girl we used to eat cornbread and milk on Sunday night after church oh the memories!! We love cornbread sweetened with just a bit of honey and slathered with melted butter. Delish! I love this. Thank you. Sweet cornbread is my favorite. I could eat cornbread (sweet, unsweetened or savory) with almost any meal! I wondered a while back if the waffle iron could be used to make cornbread. Right now, I don't have an oven, and we have really missed eating cornbread with many of our meals. I will try this and see what the family thinks. Frying it makes it a bit too greasy, but I think this will work. Thanks. Oh that is wonderful Linda Sue! 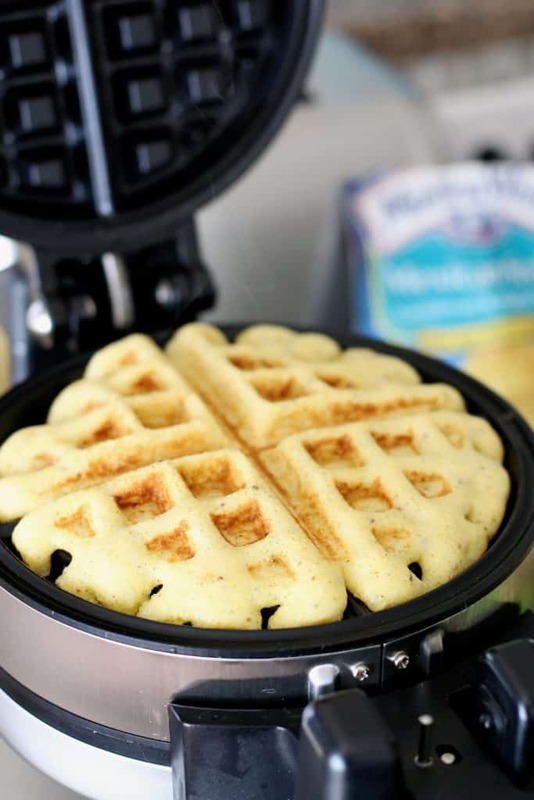 The waffle iron is great for so many things, not just waffles. I hope you can get your fix soon. Missing out on cornbread is just not acceptable.